Rendering of a proposed music theater the Red Sox owners and Live Nation would build alongside Fenway Park. The Red Sox are proposing renovations to the bleacher section at Fenway Park as well as a new function room aimed at providing “sweeping views” of the beloved ballyard, according to a letter of intent the team submitted Tuesday to city planning officials. The letter from Fenway Sports Group, which owns the Red Sox, was sent to the Boston Planning & Development Agency and signed by Jonathan Gilula, the team’s executive vice president of business affairs. The letter also provided details of the company’s proposed 5,000-seat Fenway Theater, a performing arts center eyed for land alongside the ballpark. The Sox also have big plans for the function room. Zineb Curran, a Red Sox spokeswoman, said Wednesday that renderings of the bleacher renovations and function room weren’t available because the team is in the early stages of working with the city for approval on the project. John Henry, the team’s principal owner, also owns the Boston Globe. The iconic center field bleachers, known for bargain prices and raucous cheering, have undergone face lifts before. 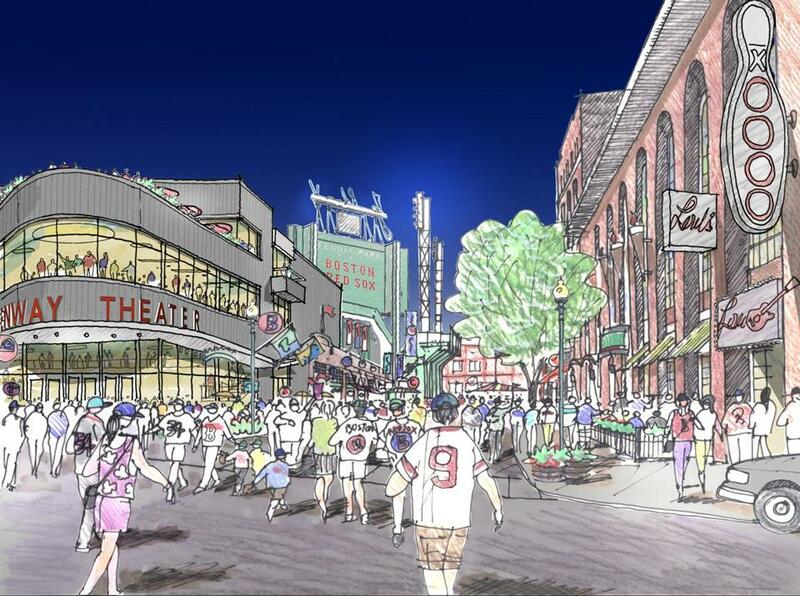 In September, the Red Sox released renderings of the Fenway Theater, proposed for a triangle of land behind the ballpark’s bleachers between Lansdowne and Ipswich streets, in collaboration with music giant Live Nation. Gilula wrote in Tuesday’s letter that the team looks forward to working with local authorities on the projects. Tim Logan of the Globe Staff contributed to this report. Travis Andersen can be reached at travis.andersen@globe.com. Follow him on Twitter @TAGlobe.